Orangutans are native to Indonesia and Malaysia and are currently found only in rainforests on the islands of Borneo and Sumatra. 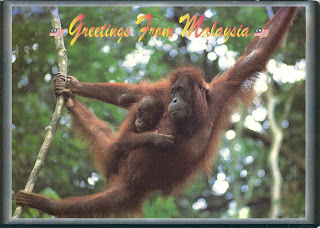 The word orangutan means "man of the forest" in Malay. They are among the most intelligent primates and use a variety of sophisticated tools, also making sleeping nests each night from branches and foliage. Their hair is typically reddish-brown, instead of the brown or black hair typical of other great apes. Habitat destruction due to logging, mining, forest fires and oil palm cultivation and illegal pet trade have caused these apes to become endangered. SL franked his postcard with 2 superb stamps issued jointly by Malaysia and Korea on February 23, 2010. 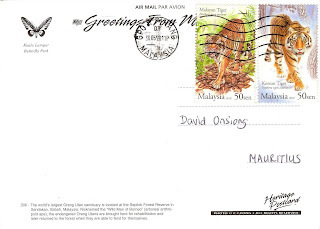 The Malayan Tiger (Panthera tigris jacksoni) is an endangered species of tiger found in the southern and central parts of the Malay Peninsula. The Korean Tiger (Panthera tigris altaica) is also an endangered subspecies and is most commonly known as the Siberian Tiger. Its population is scattered all over South East Russia, China and South Korea. Thank you very much SL. This is absolutely exceptional. Even though variety of article on this topic, this article carries many treasured points which had been never be read in other articles.